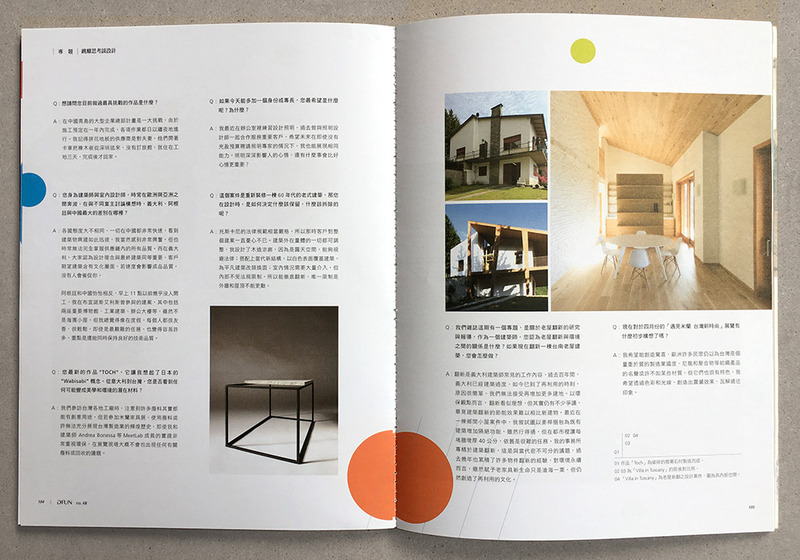 The last issue of DFUN, a Taiwanese design magazine, hosts the presentation of braIN TAIWAN and the four designers who produced the pieces exhibited in Università Statale. Below, an excerpt of the pages dedicated to us. At this link the PDF extract of the whole section concerning braIN TAIWAN. Following, the original interview to Nicola Brembilla. One word to describe Tainan? Tainan is the cradle of Taiwan’s identity. What is the biggest difference between Taipei & Tainan? Which one do you prefer? Taipei is a world city, while Tainan has an exotic charm, somehow more singular. Of course Taipei has some places that I’ve loved, like the 24h hours library Eslite for example, but I’m keeping much more stronger impressions of Tainan inside me. Maybe the oldest city of Taiwan is just more different from our european city, so it touch our senses more deeply! What is your favorite architecture you’ve seen so far? What is the most outstanding part of it? About my past experience I like to mention Sainte Marie de La Tourette by Le Corbusier. A convent that anyone should visit once in a lifetime, especially for the possibility of staying overnight. Monks go to sleep at 9 pm, so you can sneak out of your cell and stroll around in the deep silence. Walking across the suspended corridors, exploring the admirable architectural machine, till you get to a giant door. With a vigorous push open it and dive in the darkness of the church. After more then ten years I can clearly remember the chills on the skin. About our recent trip in Taiwan, I was impressed by some urban fact, more then a specific architecture. The dense district around Grand Mazu Temple in Tainan, for example, a mazy structures where public square and sacred spaces are intertwined. Or other -more intimate- contest: I remember a night in Tainan, lost in the alleys around Duiyuemen, a little square without cars, some local around a bonfire listening to a young lady playing guitar, while children chasing each other. I was amazed of how little it’s needed to see a community live peacefully in its own neighborhood. 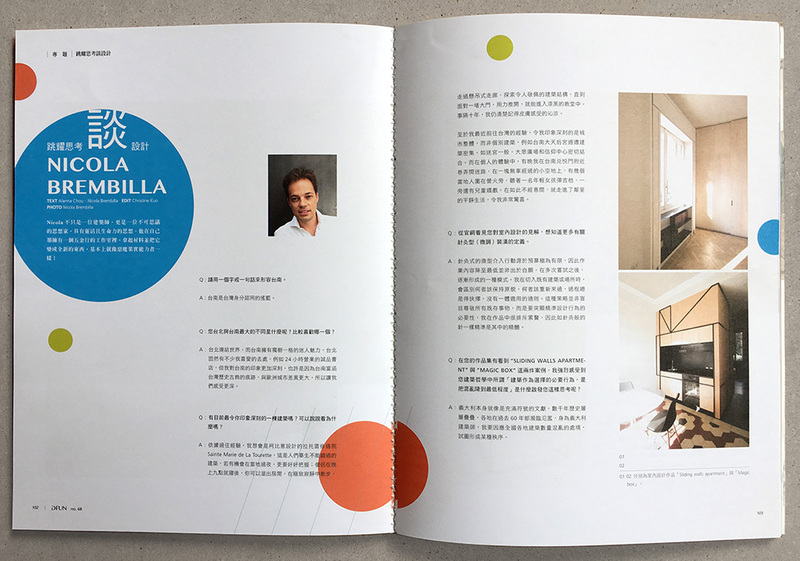 After knowing that your aspect for interior design, would you like to explain a little more specific of what micro-actions of “acupuncture” means? Micro-actions of “acupuncture”, as an intervention procedure, has born originally when strict control of the budget was required. In that case, limiting operations to the minimum necessary is not a choice. After many experience in that direction, it became a general attitude. Approaching an existing building or a place, I recognize what deserves to be maintained and what should be redone from scratch. It is always a question of selection. Tabula Rasa does not exist. This approach should not be mistaken for a generic respect of the preexistences, what interests me is highlight the design action in its precision, its necessity. My project are allergic to redundancy, go to target as a needle in acupuncture. 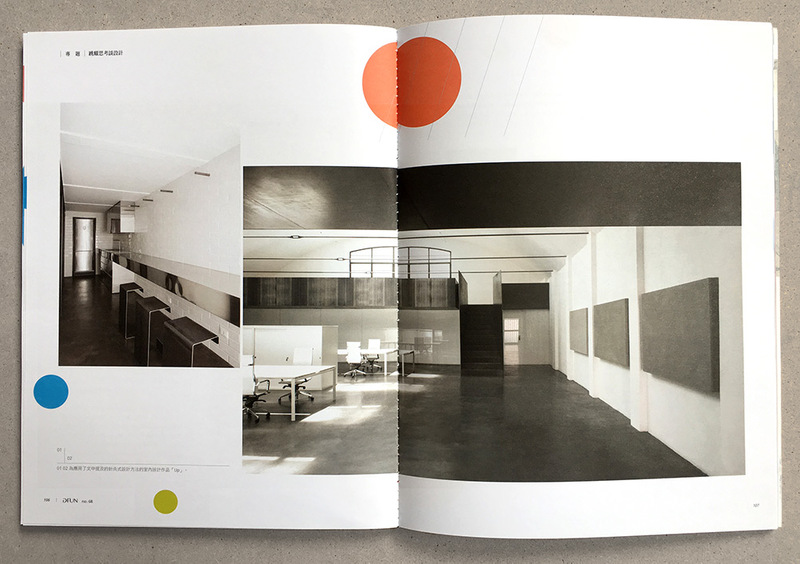 In you portfolio “SLIDING WALLS APARTMENT”, and “MAGIC BOX”, I sense strongly of how you define “architecture as an essential act of selection that goes from chaos to minimum.” Why do you feel this way? what triggers you to believe so? Italy is an intricate palimpsest of signs. There’re millennia of superimposed layer of history, where the last sixty years have oppressed with overabundance all the others. As italian architect my task is to face to this chaotic presence of built volumes spread all over the country, and apply some order. Would you like to share the most challenging case you’ve done so far? One of the biggest challenge was the project of a big company headquarter in Tsingtao, China. Assumed that the building site was to be completed in one year, the night hours weren’t exactly the rest time! I remember the parquet suppliers, wife and husband, coming from the Shenzhen region with their oak planks on the truck. They did not book any hotel, just came, work -and sleep somehow in the building site- for three days and come back home! As an architect and interior designer working in both Europe and Asia, what is the biggest difference between working in Italy, Argentina, and China? Every country has a quite different attitude. As I told, in China everything is superfast, for an architect is exciting to see a building growing as such a speed, but sometimes you can’t control completely the quality in all the supply chain aspects. In Italy, the sense of what you design is as important as the built stuff itself. Client have expectations regarding the cultural sense of an architecture. Nobody really rush you if this affects the final quality. Argentina is exactly the opposite of China. Before 11am is hard to find someone working. I was involved in two of the most important museum of Buenos Aires as well as industrial and office building -not tiny huts on the beach- and I always felt in holiday! People are so nice and relaxed that even the most difficult task becomes affordable. It must be said that I have always had exceptional technical support from the Argentines. From the most recent work on your website, I saw the coffee table “TÒCH.” It reminds me of the Japanese concept of “Wabisabi.” Coming from Italy to Taiwan, do you see any potential materials or waste that can turn into something aesthetic and environmental? During our trip inside many taiwanese factory, we’ve found tons of waste material that could be reuse in a very creative way. Despite this, I don’t believe this is the right way to express at his best the glorious tradition of Taiwan’s manifacturing during the Fuorisalone of Milan. In the exhibition you’ll probably not see anything regarding waste and recycling, even if the environmental themes are extremely present in my activity as in other member of the MeetLab, like architect Andrea Bonessa. We’re focus now on textile materials itself. The entrepreneurs we’ve met deserve it. If you can get to develop a new talent, what would you choose? and why? The skill I’m developing nowadays in the office is the ability to design light. In the past I’ve done interesting collaborations with light designers for important clients. I would like to be able to express the same ability even when there’s no budget for such a specific professional. Light is really important for people’s mood. What’s more important then make possible that people feel good? “VILLA IN TUSCANY” is a renovation project of a resident from the 60’s, what do you do to decide what to keep and what to remove? In Tuscany we faced a really strict laws situations, clients were really worried about what they had just bought! Anythings was modifiable regarding the outside volumes of the villa. That’s why I designed a wooden loggia. As an open air space, bypasses the law, creating a new face to that banal building. The white villa is still visible at the end, together with the contemporary graft. The interior situation required radical interventions, there we were free of any law restrictions, we simply revolutionized all, the only constraint were perimetric walls and roof. Our magazine is working on a project showing the possibilities of renovated architecture from decades ago. As an architect, what do you think of the relationship between renovated architecture and the environment? If you are assigned for a renovation architecture project, what is it like? In Italy our collective task as architects is mainly renovation. During the last century my country was too much built, now is time to reuse, and the reason is simple: we can’t permit other soil consumption anymore. From the environmental point of views this seems ideal. To be honest, the theme is much more controversial because energy saving performance of a renovated building hardly equals a new one. In a recent project of a little cabin in the countryside I’ve tried to fix the bug by isolating the existing building with straw bales. It works there, but in urban contest is hard to add 40 cm of thickness to every existing walls! My offices is specialized in architectural renovation and I feel it as a really contemporary issue. In the last years we also made some experience in object renovation. Designing new life for old piece of furniture is of course a small drop in the sea of environmental sustainability, but still create culture of reuse. As for the upcoming project cooperating with Taiwanese textiles industry, would you like to tell us what’s in your mind? In my mind there is the aim of create fascination. Too many people in Europe still have a mental image of Taiwan as a factory country devoted to quantity more than quality. Textile products like nylon and poly doesn’t have the fame of rich material, but they’ve some particular properties. I would like to revolve this legacy with something astonishing, using strong colors, lights.